Over the last couple of years, I've grown to appreciate custom rosters. My hat goes off to those guys who dig and start editing the official NBA2K official roster into one that plays not only the way they would like it to, but those who download it. However, even though are some great rosters out there, there are probably ten times (or more) that number of rosters that have a lot of holes in them. It's probably because the roster project was a bigger time commitment than they expected. But, I've even seen rosters that are complete that are missing players, haven't assigned plays to players or just have attributes that don't make any sense. Because of that, I felt like it would be a good idea to put together a pretty detailed NBA2K roster editing checklist so you'd know what areas you need to address up front. So what I'm going to do first is talk about planning your vision of a roster and then I'll go into the more detailed checklist. What kind of roster do you want? Before you begin your project, you'll need to decide what kind of roster you are going to create. Here are some custom roster ideas you might consider. These aren't unlike some of my MyTeam theme team ideas I already shared with you. Real NBA roster If you want to focus on the cleaning up the official 2k roster, you aren't alone. Many people tackle this project each year. Legends roster Have a love for the greatest players who ever played the game? Then the legends roster is for you. Roster from a particular year As a Pacers fan, a couple of my favorite teams were the one in 1998 where Reggie beat Jordan in Market Square Arena with a last second shot and the team that went to the finals in 2000. It would be great to play either one of those seasons if there were only a roster for that year. Roster for a particular team I guess this is an extension of the roster for a particular year, but I would love to have every Pacers rosters since the team's inception. I know that in NBA2K, they had a year where they had all of the best Chicago teams Jordan was on. Hometown teams roster Another one of my favorites is the hometown team roster. This is comprised of players from their hometown states. FIBA roster If you like the International Basketball Association, then focusing on the FIBA rosters in a similar way to that you could choose to do for NBA rosters. Olympic roster In a similar strategy, you could opt for creating the Olympic teams rosters. ABA roster Since the Pacers were in the NBA, it would be great to relive the ABA days, complete with the players, uniforms and the trademark basketball (if that's even possible). Euroleague roster A few years back, the Euroleague teams were actually in the game. Fans of that league might want to recreate that. Fictional roster I also am a big fan of this roster concept. Here you make up all of the players and put them on your roster. College or high school roster I know there has been a time or two that I have seen guys create rosters for colleges and even for high school players. Celebrity roster Make a list of all time celebrities and put them in the game. You could even include you and your friends. WNBA roster While not possible now, supposedly the WNBA is going to be in NBA2K soon. Maybe it will be a possibility. Once you know what kind of roster you want to create, it is time to set some rules about how you will address the process. After you have decided what kind of custom roster you are going to make, you might want to consider some of these issues up front before you begin the process. What will done look like? Have a good image of what done will look like for you so that you can actually USE the roster. Roster editing doesn't really matter if you never use it. How will you know what kind of job you did. Sources of information Where will you get your information. Will you watch game videos from YouTube, get your stats from NBA.com or use some other service. Assignment process How will you determine ratings? What kind of scale are you going to use? What kind of criteria will you use to assign badges. These are just a few of the ideas you might want to consider. Gameplay only or MyLeague ready Are you mainly interested in playing games or are you interested in using it for realistic MyLeague purposes. Real life and simulation stats Will you care if the stats from simmed games look as good as stats in games vs users? Collaborating A roster project is huge project. Will you rely on the work of others for your roster? If so, what parts? Will you actually partner up with someone else or a group of other roster editors? I'm sure there are other things you might want to consider but the main thing I wanted to accomplish is to get you to think about mapping out your project so you can get a clear idea of how to tackle it right. With that out of the way, let's go through a list of all of the items that you'll need to work on. OK. Now, it's time to break down each part of the roster you'll need to consider editing. Let's go through them. Correct players Believe it or not, many teams don't have correct rosters. You'll need to take the time to make sure the right players are on the right teams. and make sure that you add any missing players. Individual player editing Each individual player has a host of things you need to take a look at. Here is a list of those items. Team editing Every team also has specific areas you'll need to review. Free agents With the bulk of the work out of the way, you'll need to take a look at the free agent pool to see how deep you want to edit the free agent pool. Draft classes Many people just focus on draft classes. For each of the players in the draft classes, you'll have the sort of process to go through. And you can also take some of the same similar roster ideas and apply them to draft classes. Gameplay sliders and settings The icing on the cake are creating a set of sliders and settings that will work with your roster specifically. That's quite a list. And it's pretty daunting. I honestly don't know how people get through the entire project. It's an incredible time consuming one at that. It's likely that when and if you finish your roster project, it is time for the new game to come out and you have to start the process all over again. If you think editing your own full custom roster is to much of a project, there is another idea. Consider specializing in one of the areas above. I've seen people who only work on appearance of the players, only work on courts, only work on signature skills or only work on playbooks. 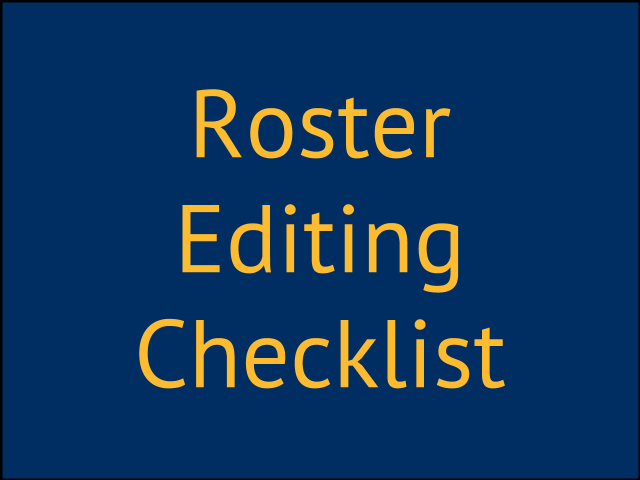 There are many roster editors who would appreciate a specialist in a specific are of the roster. What are your suggestions for wanna be roster editors? What kind of suggestions and tips would you give to future roster editors? Can you think of anything I need to add to the checklist? Also, while you are here, sign up for my free email updates in the box below. Whenever I start playing MyTeam, I think it's a good idea to have an idea of what kind of team you want to build from the start so you know what players to buy. 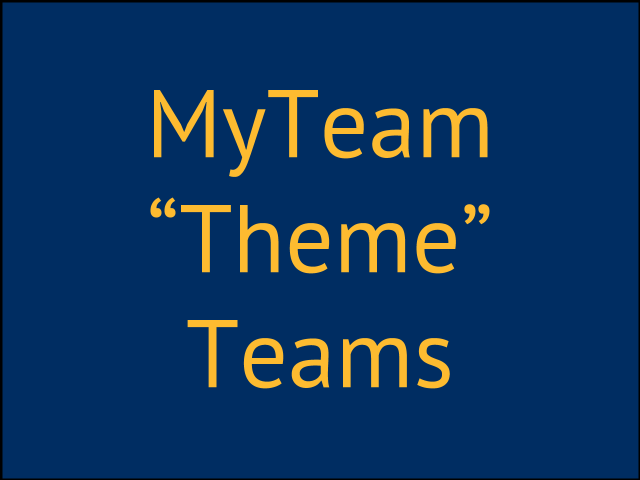 I call these ideas for MyTeams, "theme" teams. Theme teams aren't necessarily put together to beat every team you face but instead are put together to see how your theme can compete and for fun. You'll be a lot more interesting opponent to those that appreciate basketball and probably have a little bit more fun. Let's go over the three teams I usually build in MyTeam and then I'll share with you some other ideas you might want to consider for yourself. Right from the start, I always have three "theme" teams I want in MyTeam. I typically only accomplish the first two ideas and I'll explain why I don't focus too much on my third team in a second. As a side note before we get started, I've also gone a step further and customized my arena and uniforms in MyTeam to match my theme. Here's some good video of it. 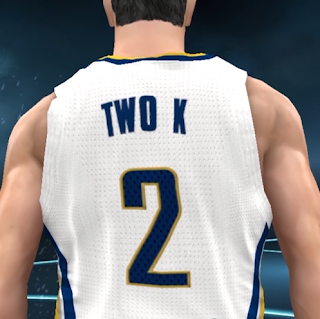 C2K Indiana Pacers As you might already know, I am a big Pacers fan. I always like to put together the current year Indiana Pacers. I do this because I really enjoy using the team each year across all modes. I like to get as tough as I can with my Pacers each and every year. You can't get a better workout for your team than when you use it in MyTeam. That's because you are always playing against some of the all time greats in league history. C2K Indiana Allstars My next theme team is one of my favorites. The only players that can be on this team are players who were born in Indiana or graduated from high school in Indiana. Indiana has a rich history of basketball and some really talented players are from Indiana. With a starting five of Oscar Robertson, Eric Gordon, Larry Bird, Shawn Kemp and Miles Plumlee, I can have a lot of fun. Thanks to my good NBA2K friend DC for the idea to build a team like this in the first place. C2K All Time Pacers My last theme team is the one I really don't build but consider every year. That team is the all time greatest Pacers. While I can put together a pretty good team, it's disappointing that I can't get Reggie Miller, the greatest Pacer of all time. And because of that, I just can't see myself using it. Alright. So those are the teams I try and build. You might like my theme teams but if not, I've compiled a list of additional ideas of teams that you might want to put together in MyTeam. OK. Let's get started going through some additional ideas you can choose from in MyTeam. These aren't in any particular order. Actual NBA teams Of course, the easiest to create are the current year teams just like my C2K Pacers squad. But you might also be able to create teams from previous years. Hometown state or city teams Hometown teams are my second team. I typically like my home teams to be players from a certain state. If you thought Indiana had a tough team, check out all of the great players from North Carolina. All time greats from specific NBA teams You can never go wrong with the all time greats from specific franchises unless of course your all time great isn't in the game. All decade teams Teams I'd personally like an all 80's team but you can take any decade and compile a list of teams from specific decades. All year teams (or teams from certain years) Similar to the all decade teams, you can limit your focus to players from specific years. All division teams Pick the best players from NBA Divisions like the Central Division for example. All conference teams Pick the best players who played in the Eastern Conference or in the Western Conference. All time international team Pick only international players to fill your MyTeam squad. Regional teams Pick the best players from certain places in Europe for example. Olympic gold medal winner teams Pick only players who have an Olympic gold medal. All bronze, silver or gold teams Only pick players who bronze, silver or gold cards. Salary cap teams Instead of loading your team with Opals and Pink Diamonds, put limits on the number of great cards you can have. All transition team Pick the fastest players in NBA history. All NBA teams from specific years Pick players who made the all NBA teams for specific years. All defense team Pick players who have won the Defensive Player of the Year Award. All offense team Pick the top leading scorers in NBA history. MVP's Only pick players who have won the MVP award. Rookie of the Year Only players who won the Rookie of the Year award can be on your MyTeam. Sixth man of the year Only players who won the sixth man of the year award. ABA team Former ABA players only. College alumni team Teams of college alums like Indiana, Kentucky or North Carolina. College conference teams Big Ten, ACC or SEC players. Dunk contest award winners The dunk contest winners. All technical team Only pick players who have the most technicals in NBA history. I'm sure you can see the ideas for some pretty incredible MyTeams can be put together even beyond what I've come up with. What kind of theme teams do you use? Let me know in the comments what kind of theme team you are running with or if you have any other ideas that might be good for MyTeam. Also while you are here, sign up for my free email updates below. I play almost exclusively 12 minute quarter games. Because it's a regular length game, I have to use my bench. That's one of the main reasons I like playing a 12 minute quarter game. It's more realistic to use your bench in a 12 minute quarter game than a 5 or 6 minute quarter game. I'm not sure guys even get tired in a short game. In this article, I want to talk about using auto vs manual subs in NBA2K. I'll talk about some tips for each of these approaches and then go into how I use what I use in my games which is auto subs. In the coach settings, you'll find the option to set substitutions to "auto" or "manual." I always check this setting prior to each game to make sure it's how I want it to be and I recommend that you do that too. Normally my coach settings stick just fine, it's what I want it to be and I don't have to change it. Should you use manual or auto subs? Let's address the first question I think you should ask about substitutions. Should you take total control and manually sub your guys in and out or let the cpu do it for you. If you are new to the game, I would set it to auto and let the cpu do it for you until you get used to how to play. But, in a true "sim" approach, I'd agree that you should make all substitutions decisions during a game yourself. In reality though, I have a tough time navigating all of the substitution menu's quickly during gameplay as well as getting everything done during a timeout. While you get use to how to sub on the fly and during timeouts once you've done it often enough, I just haven't done that yet. I still fumble with the controls to get who I want in and when. It's for that reason that I use auto subs almost exclusively instead. However, I don't give total control to the CPU without some direction as to how I want my substitutions to work. I think it's a mistake just to put it on auto without some further setup which I go through a little later below. If you choose to sub manually, you'll want to have a strategy for how to sub your guys in. Let's talk about some things you'll want to think about while subbing manually. Rotations As a regular roster user, one thing I like to do is get into a subbing pattern that matches my real life Pacers. If Nate McMillan likes to bring in Sabonis off the bench first around the 5:00 minute mark, then I'd want to match that manually. Otherwise, I'd sit down and think about how I want my rotations to go. Some people like to platoon swap 5 for 5 guys but I think it's better to bring in two maybe three guys in at a time instead. If you want to use real life rotations here's a website that will help identify sub patterns. If you want to preplan your rotations, here's a rotation worksheet I found you can use. Fatigue Next up is fatigue. If you aren't calling timeouts, your guys are going to get tired. This is something you want to watch for during the game as some games guys get more tired than others. Call timeouts and check out how much energy they have and consider subbing a player out sooner if they are tired. You'll also want to keep tabs on minutes if you are playing a season with fatigue on. I always feel like that if you run a guy into the ground during the season, he's more likely to get hurt. So play attention to fatigue not just in games but also over the course of the year. Foul trouble In a 12 minute quarter game, foul trouble can happen. Keep an eye on guys that get two quick fouls early or who rack up fouls during the game. Sub them out. Injury If a guy get's hurt during a game, you'll need to adjust your rotations. Give some thought to how you'll replace a guy if he goes down with an injury. If you are in a MyLeague setup and an injury last several games, you might want to bring in a bench player to fill a starters slot to keep your bench unit intact. Matchups This is one area that I am pretty stubborn in and that is adjusting my lineup based on the matchups I face. I think one of the reasons I don't worry about it too much is that we are typically over matched anyway so it won't matter. But I really should look at going small or big at times and I don't. At the end of the game, I will put in my free throw lineup or three point shooting lineup if I need it. Offense, defense, situational In late game situations, you might want a defensive unit on the floor for certain possessions that you know will be followed with a timeout and make another substitution. Position I think this is important to think about from a 2K perspective. I think of each player more by their icon and try to keep each player in position based on that to cut down on mistakes. As an old guy, I might want to put Oladipo on at the point guard position or Bogdanovic at the four. But if I do that, I risk making an error when I icon pass. Because of that, I try to keep players in their natural position as much as possible. First and second units I definitely play 10 guys with a first and second unit. I like to keep these units together and keep enough scoring coming off the bench. Hot player I use to play a Wizards guy who once went off with Otto Porter and that guy was so hot it was crazy. If a player gets hot like that, you'll want to let him ride from time to time to take advantage of his hot streak. On auto subs, you risk that hot player coming out - especially if you play the HOF CPU, you can count on that guy going to the bench after a timeout on auto subs. Keep bench focused In a MyLeague setup, you'll want to play your deep bench guys periodically to get them minutes so they stay involved and focused on the team. You don't want them getting lost when you might need them at some point. I also think it will some with team chemistry. Scrubs If the game is out of reach one way or the other, it's time to get your other guys time on the floor. I also like to do this so I avoid injury to my main players during garbage time. I've seen it happen in league play where a guy is up 30 and his superstar gets hurt. You don't want that to be you! Those are just some of the things you'll want to think about when you manually sub. Let's talk about some tips to make manual subbing easier. Here are a few things I would do if I was a manual subber or wanted to become one. Plot out rotations Before the game starts, plot out how you want to sub and when. Practice the manual subbing controls Get used to how to sub in game situations. I'd go into a play now game vs the CPU and in the settings turn the shot clock off. Then during the game, I'd work on learning the inputs you need to know to sub while play is taking place. I would also call timeouts and work on the controls to sub guys in timeouts. Once you've committed these inputs to memory, you'll be able to do it on the fly in the game, during free throws, breaks in play, between quarter and during timeouts quickly and easily. Set up the on the fly coaching lineups One great feature of the MyLeague's is the on the fly coaching options. You can preset bench, quick, tall, 3 point, free throw, defense as well as an additional custom on the fly lineup you can use for whatever you want. But keep in mind that just because an on the fly lineup says "quick" for example, doesn't mean you have to use it that way. You could set up the quick on the fly lineup to be your first substitution pattern, tall to be your next and then the bench. I know I have used the custom one to be my third string when the game is out of reach and I want to sit my main guys. Call timeout when you need to sub Nothing is more annoying than playing an opponent and right in the middle of a possession they pause to make adjustments in settings or put in subs. If you have trouble subbing on the fly, call timeout when you need to make subs. At the very least, if you have to pause, pause during a timeout or between quarters to make those changes. Those are some things that I think are helpful in terms of manual subs. Now let's talk about auto subs and what I recommend there if you are going to let the CPU take care of it for you. Now if you are new to the game, certainly start with auto subs until you get use to playing. Once you get used to how to play, you'll have to decide whether you want to sub manually or use auto subs. When it comes to auto subs, you don't just want to set it on auto and forget it. There are few other steps you want to take to make it work better for you. Before I play, I set the rotations up. I establish who my starters will be, who will play off the bench and assign minutes for those players. For tips on how to assign minutes, check out Schnaidt1's MyLeague slider post here on Operation Sports. All credit goes to him for how I approach auto subbing. He has since updated how he sets up auto subs in this video although I still use his old method. EXCEPTION: If I am following what I call the "box score rule", I'll just set the rotations to the number of real life minutes each player received. If they didn't play, no minutes are assigned. There are three settings you will want to change under the coaching sliders. These settings have worked really well. Although Oladipo sits more in the first quarter than I'd like, he still gets his share of minutes. The minutes balance out well, I don't have platoon subs and guys who get hot tend to play a little more to take advantage of it. You'll want to keep in mind that even with auto subs on, there will still be times when you'll need take control of who is in the game. I often turn off auto subs when the game is out of reach and just play my bench. When a player gets into foul trouble, I sometimes have to sub him out manually because the game seems oblivious to foul trouble at times. The other main issue is dealing with matchup problems. With auto subs, you'll be somewhat at the mercy of your rotations. That can hurt. Another issue is that if you have timeouts to manual and you don't call timeout (or your opponent if they are on auto subs), there's more likely to be a foul called on the floor to stop play so guys can get in. 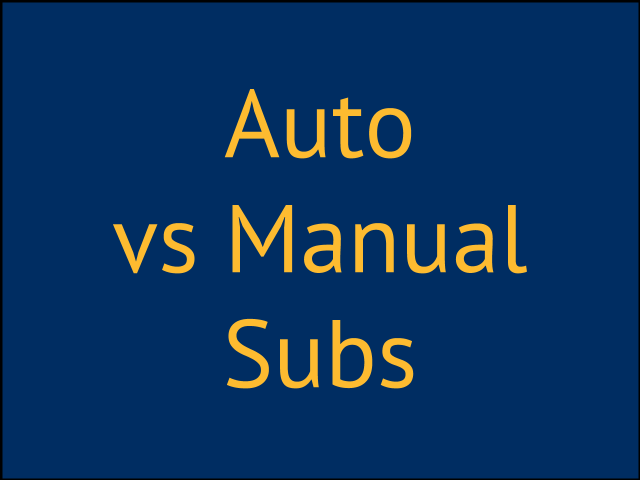 Do you manually sub or are you an auto subber? I personally am an auto subber so I can focus on playing. Let me know in the comments how you approach subbing your players. I'm interested in any tips you might have about subbing. Also, while you are here, sign up for my free email updates just below. One of the best features in NBA2K is the MyLeague option. A MyLeague gives you complete control of every aspect of your NBA2K experience. The problem is that as good as the MyLeague is, there are some things that happen in MyLeague that aren't realistic. In this article, I'm going to go through some steps you can take to set up your own realistic MyLeague experience. I've also included a video down at the bottom of this article. The first step in getting a great MyLeague experience is to envision what kind of league you want. Are you a regular roster guy that never likes to change anything? Are you a wheeler dealer that likes to take a small market team to the championship? Or, do you get annoyed when a superstar leaves a big market and goes to a small market team? Everyone is different. So, you have to have some general idea of what kind of MyLeague you want to have before we can talk about how to set it up. So, let's brainstorm a few ideas and then talk about how to implement them. Here are some conceptual ideas for MyLeague's you might want to try. Rebuilding a franchise Here you start with the the regular day one rosters but you set out to rebuild a franchise that is struggling. A good example might be the New York Knicks. It's a franchise that has struggled for a long time. But with you at the helm, the New York Knicks have new life as you make the deals that put together a winner. Multi-team control In addition to focusing on one team, could focus on controlling several teams at one time. I know there are many people who do a 30 team controlled MyLeague where they micromanage the whole league. Historical In this type of MyLeague, you begin years in the past and see if history repeats itself. Will Michael Jordan still be greatest of all time if you go back in time? The real killer idea here would be to start with the roster from the beginning of the league. From there, you would import draft classes that contained the real players drafted that year. You could even incorporate the old ABA teams in this concept. Greatest of all time dream teams In this MyLeague, all of the teams would be comprised of the greatest players to ever play the game. How would Wilt Chamberlin fare against Shaq? You'd be able to see just that kind of cross era matchup. You'd be free to have all of the players represent the same teams they did in real life or you can put them all on different teams using the next idea. Brian Mazique is well known for his Ultimate Legends Roster. Current players mixed with previous era players Not all players in league history were the greatest of all time. You could also combine current players with past players or combine past players into the league by putting them into draft classes. Fictional league This is another one of my favorites. Here you have a MyLeague of totally fictional players who have never played the game. You'd learn all about the players once you started playing games. Complemented with fictional draft classes, you could create a whole new universe of league memories from scratch. You'd also have the option to relocate and rebrand all of the teams in the league around a totally fictional league of completely different identities in completely new arenas wearing completely different uniforms. One of my favorite rosters is Tim's Fictional Roster. High school, college team, international league or hometown teams Want to use all high school players or college players or international players? Want to play your own euro style league based in cities in Europe? Have every player play on a team from where they were from? Chances are someone has worked on a roster and branding that will help you do exactly that. I once created my own team of Indiana allstars made up of players who were born in or who graduated from high school in Indiana. I had my own uniforms and arena I developed. MyPlayer, MyCareer player lock Like MyCareer but hate the story mode that comes with it? The solution is to put yourself on a roster and play as yourself in your very own MyLeague. You'd play each game as you on player lock. Keep in mind that you'd also play the backup player subbed in for you during each game. You could also watch your progress as you sim games if that is what you wanted to do. You could also sprinkle in your friends, family or other people you'd like to add to your MyLeague to see how they compare to you. Fantasy draft Nearly all of the above concepts could also be done by starting the MyLeague with a fantasy draft right from the start. Each team would start with a fresh slate and build its own history from day one. Expansion teams You could also expand on any of these MyLeague concepts by adding expansion teams. League expansion is always exciting. I remember when the Magic and Raptors came into the league. Head to head online Another option that can be combined with any of the above concepts is playing your friends in an online MyLeague. This could be as simple as choosing one other friend who chooses a team in the other conference to a full league. Those are just a few ideas of I've seen floated around about different ways to play MyLeague. Once you have come up with your concept, it's time to look closer at the setup of the league to bring your concept into a reality. The place to start when setting up your MyLeague is choosing a roster. This is an easy decision if you are a regular roster person. You'll just use the default roster and go from there. For many years, I was a default roster player. But with time, I've always found my Indiana Pacers were always somewhat neglected. Some years it takes months to see any roster adjustment and often the team doesn't play as it should. This isn't as much as a concern for teams that get a little more attention like the Lakers so you'll level of tolerance and which team you choose will have some impact on whether the default roster suits you. 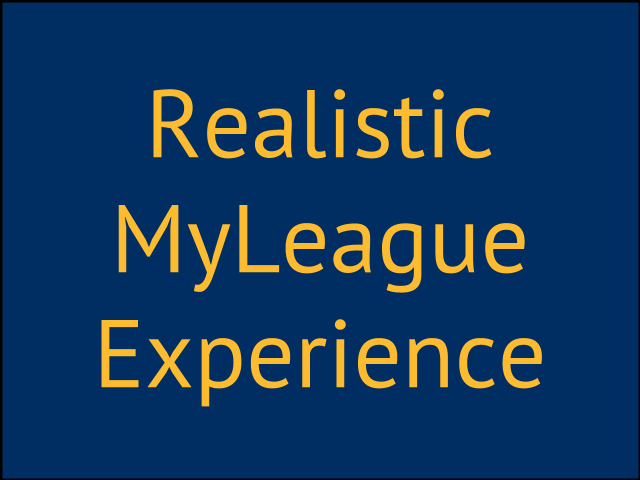 The roster you choose for you MyLeague is probably the biggest determining factor in how close to realism your MyLeague will feel and how well you like the experience. Let's take a look at the types of rosters I've seen created. Depending on when you read this, you'll have to do some research at the time you are starting your MyLeague. Default roster put out by 2K This is the official roster as seen through the eyes of 2K. 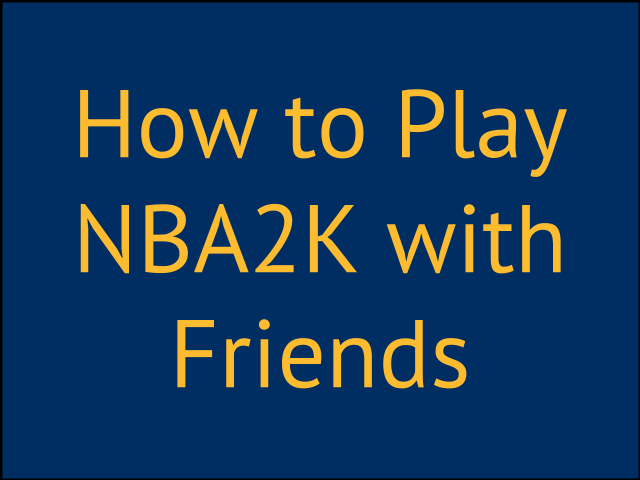 It's used by the vast majority of people who play NBA2K and will work well for most people. Custom edited rosters There are many roster editors out there. Many take the official roster and tweak every aspect of the roster from attributes, tendencies, badges and more to more accurately reflect the real life players. This is always subjective and with some research, you'll find roster makers whose ideals work with what your picture of real life is. Period rosters Other roster editors create rosters from different eras like 2000-2001 or other old school seasons. Legends Some roster editors focus on creating the legends of all time. Other basketball leagues I've seen other roster editors create the ABA, Euroleague, college teams or even high schools. Chances are if you are interested in some type of collection of players, someone else is too. Fictional roster Usually there is someone who creates a fictional roster that you can use. Create your own roster Many people have a standard that no other roster editor can live up too. In many cases, that might describe you, especially if no one spends time making the kind of rosters you envision for your MyLeague. This gives you the ultimate control of your MyLeague. The downside to creating your own roster is the time it takes. A roster is almost never finished and there is always some way you can improve it. Those are some of the types of rosters you may be able to choose from. A few important notes about rosters. I've tested many rosters and many are not completed. You'll want to make sure that the roster you used is finished. Not only that, you'll also want to test the roster out and see how you like the game play and look at it very carefully. It often doesn't take much for me to decide not to use a roster. It might be the Reggie Miller's shot doesn't look like it should or he hasn't been assigned the proper plays. Sometimes, contracts are sometimes out of whack. These are clues that the person who edited that roster didn't put the kind of effort into the roster you'd expect. If that's the case, you certainly won't be happy with your MyLeague. So take your time to in choosing a roster by using it. You can both play games with the roster and also sim the roster out a few seasons to see what happens. It's almost best to wait until the game has been out months before you start your "real" myleague. Most roster editors work all year on their rosters. When the next game is ready to come out is almost the ideal time to start your MyLeague. At the very least, once the season is nearing the end, most of the work has been done. You can find people promoting their rosters as well as some of the other items below over on Operation Sports NBA2K roster forum. After your rosters, you'll want to focus next on draft classes. The next component to a realistic myleague is what draft classes you'll use. If you are a regular roster type who only plays one season, you won't need to worry about draft classes. However, in most cases, you'll run your MyLeague out a few years to see how it plays out. In that case, you'll need some draft classes to load into your MyLeague. Just like rosters, draft classes have their own world of creators. Here are a few types of draft classes you'll see. Auto generated draft classes NBA2K allows you to generate draft classes for each year that goes by. These draft classes are all computer generated. Some people are extremely picky about draft classes. Some draft classes aren't very strong and the league gets less superstars. Or too many. Further, other people don't like the how draft classes progress because of peak start and end dates. Still others are default players where the surprise is part of the process. Historical draft classes This year 2K put out historical draft classes with old school players in them so you could incorporate them in your MyLeague. Other draft class creators set up their own historical draft classes for certain years. Fictional draft classes Other creators focus on draft classes of totally fictional players. Many of these creators take such pride in their work, they create draft reports to go along with them. Recently, I found one guy who created 10 draft classes which is awesome. Actual real life draft classes There are still other draft classes that focus on the real life prospects of the next two or three years. They spend time on actual faces and try and get a 2K version of the real life player. The most common real life draft class is the off season draft class. People often like to use this once the season ends and use it to play during the time before the next game is released. Custom draft classes you create Again the ultimate is to create your own draft classes for the full experience and control. You'll also want to make sure the draft classes you choose are up to the standard you want. The other thing is that if you find someone who makes draft classes you like, you'll hope they create multiple classes to get you through several seasons. Developing talent through draft classes is probably the most unique part of the MyLeague experience for the multi-season MyLeague player. I've seen many discussions surrounding sleepers, draft busts and the like that make these draft classes a lot of fun. Certainly, you can run your MyLeague on default. But, for more realism and control, there are basically four areas of focus for these sliders and settings that you'll want to consider looking at. 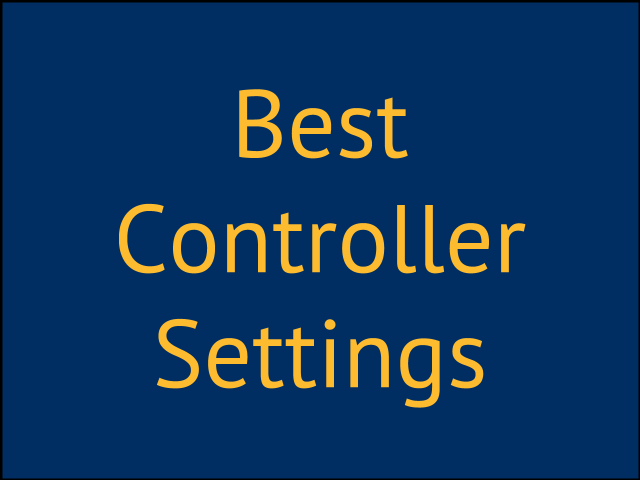 Gameplay Aside from the basic settings for number of games, quarter length and difficulty, there's also a number of sliders you can adjust that affect gameplay for both you and the CPU. MyLeague These are things like trade deadlines, salary cap, injuries and more. There are also sliders that set the difficulty of the simulation and a whole myriad of other activities that occur on a daily basis. Progression Progression is how players talents develop and fade. This is controlled a lot by the peak age start and end dates of each of the individual players. But also, there are a ton of sliders that control progression that can be adjusted. Training Players can be trained according to how you'd like them to be trained and you can set and control how training works. Just like rosters and draft classes, you can find users who have taken the time to develop unique and customized settings and sliders you might want to use. Or, if you prefer, you can develop your own sets of sliders and customized settings by simming several seasons ahead to see what your league looks like a few years in the future. You'll likely discover unintended things like too many great players, not enough great players or a league of outstanding three point shooters. Once you see what the league looks like in the future, you can see what your league will look like and where you might want to adjust any of the above settings and sliders. Once you've set these up, there's probably one additional area you'll want to consider controlling for greater realism. That's control of every team in the league. The final step in your MyLeague setup is deciding whether you will control just one team, more than one team or all of the teams. Most of time, controlling all of the teams is a little too daunting of a task for me. For that reason, I put many of the functions of each team on auto while keeping other functions on manual. Having control of each team allows you to control many other factors that have a huge impact on realism. Let's walk through some of these areas that are important. Transactions Trades and other transactions that don't make sense can be stopped before they take place. You can decide where you want players you want to be or not be. Coaching settings You can set up rotations for players along with defensive game plans for opponents. If you like to sim games, you can set the focus of how your team plays while simming games. Playbooks You can add and remove plays from each team playbooks and adjust player playtypes based on that teams personnel. Those are just a few of the items you'll be able to control when you control more than one team. 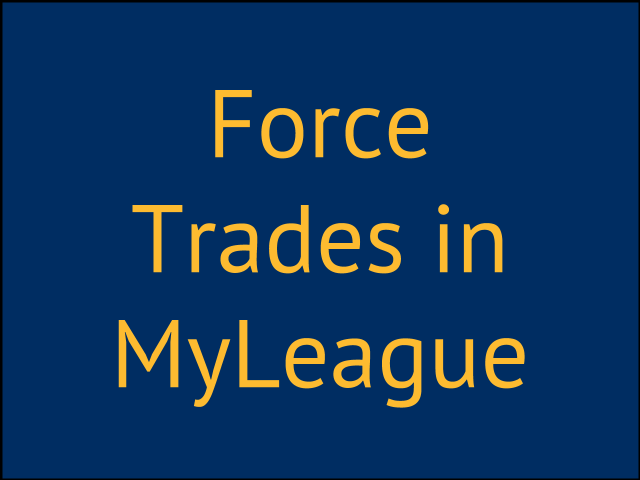 You'll want to take a look at each of these items you have control over and make a decision on what you want for your MyLeague. How have you set up your MyLeague for realism? Those are a few of the top areas that will help you MyLeague be way more realistic to the vision that you have when you start. What tips do you have that you can share in the comments about how you made your MyLeague more realistic? I'd love to hear from you below. Also, be sure and subscribe to my free updates in the box below the video.